A welcome addition to the Hartford Florist Supply lineup — Starting in January of 2010, we will carry a full line of green plants, tropical foliage plants, annuals, and perennials. We will also carry a complete line of dish gardens, cactus gardens, and bonsai gardens in a full array of sizes and styles. Lush tropicals and vibrantly colored flowering plants, sized from 3" pots up to 14" pots. From quality-first, dependable growers and partner farms from New England, California, to Canada. Carrying a full line of offerings including flowering plants, tropicals, seasonal offerings, hanging baskets, herbs, ferns, and a great assortment of ivies in all sizes- you're guaranteed the highest quality product from a dependable and trustworthy source. The best plants available from your favorite source for cut flowers, supplies, and all lines plants- Hartford Florist Supply, Inc.
Visit the specials section for a full listing of current products and pricing. 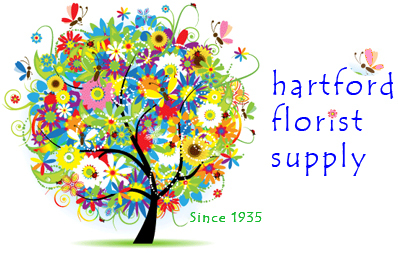 At Hartford Florist Supply, we also carry a full line of floral supplies and hard goods. Glassware, plastic, ribbon, Oasis foam and forms, candles, foil, cards, picks, wire, florist tools, seasonal items, and just about any supply item you can imagine. From wedding and event needs, to basic everyday shop items, we carry a full line of supplies. What we don’t carry in stock, we will work with you to have it in our warehouse in a 48-hour turnaround. You place the order with your sales rep, and we have it available for pick-up, or delivery, in 48 hours. Thousands of available items all guaranteed to be in your shop in 48 hours, compliments of our partnership with one of the most diverse supply import companies in the country.